New Mexico has had a long and distinguished history in paleontology. The state has a number of great places to find fossils, including some of the world’s best sites for animals from the Triassic period. Many of these, and a good number of dinosaurs from the Jurassic and Cretaceous periods, are on display at the terrific New Mexico Museum of Natural History. 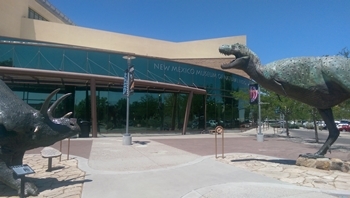 About a block from the edge of Old Town Albuquerque, the New Mexico Museum of Natural History (NMMNH) is a beautifully designed building that houses a large collection of fossils and exhibits. The majority of fossils at NMMNH were discovered in New Mexico, and the museum does a great job helping visitors take a chronological journey through the state’s prehistoric time. Outside the museum near the entrance are two life-sized dinosaur sculptures, one called “Spike” the Pentaceratops, the other the tyrannosaur Albertosaurus. My six-year-old was excited to see them on the way in to the parking lot; after a long drive, it signaled to him that we had arrived and were about to see some dinosaurs! Once inside, the very first dinosaur most visitors will see is the huge Tyrannosaurus rex “Stan.” This cast is one of the most well-known dinosaurs in the world, and it is posed in a very dynamic way, head down and ready to greet young visitors eye-to-eye. We have seen casts of “Stan” in a number of other museums, but we like the pose in New Mexico the best. One thing that strikes you immediately in the NMMNH is how large it is. There is a LOT of space, the lobby is large, the stairways are large, there is just a lot of room compared to many natural history museums. The building itself is quite beautiful and there are a lot of little touches of artwork and design inside that are very impressive. When we visited, we saw “Stan,” then immediately took the stairs up to visit the Jurassic gallery. The most visually impressive room in the museum, the Jurassic Gallery contains several full-skeletal mounts. 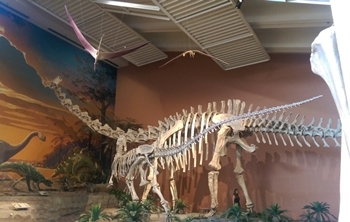 The two that stand out immediately are very large dinosaurs from New Mexico; in fact, the fossils were cleaned and prepped in the museum’s Fossil Works laboratory. The largest is a giant sauropod named Seismosaurus according to the NMMNH display. When I first saw it I thought it was a Diplodocus, it looks very similar and was a contemporary. Later I found out that recent studies consider Seismosaurus a junior synonym for Diplodocus. Whatever it is called, it is a huge dinosaur, one of the longest ever found in North America. The dinosaur that is posed attacking the Seismosaurus (or Diplodocus) is very large theropod called Saurophaganax. This huge predator is very similar to its contemporary Allosaurus, in fact some scientists consider it a very large species of Allosaurus. But make no mistake, this is a huge predator, with estimates that it grew to between 35 and 45 feet long. 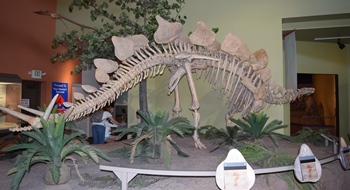 The first Saurophaganax fossils were found in Oklahoma, and the most recent have been found in New Mexico. The other highlight of the Jurassic Gallery is a beautiful Stegosaurus. This large herbivore lived at or near the same time as the Seismosaurus and Saurophaganax. The displays in the Jurassic Gallery feature numerous plants, and there is a wonderful mural on the wall featuring a Jurassic scene that was painted by famous paleoartist Ely Kish back when the museum was new in 1985-86. 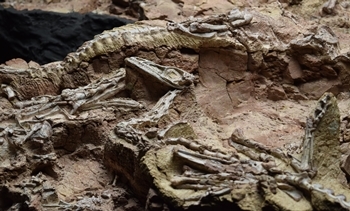 While there have been many Jurassic and Cretaceous fossils found in New Mexico, the state is probably best known in paleontology for its late Triassic fossils, especially the discovery in the 1940’s of Coelophysis at Ghost Ranch in Abiquiu, NM. At the NMMNH, a slab from the original Coelophysis quarry there is on display, and it is fascinating to look at. Although it is not terribly large, it is possible to make out bones from at least four different animals. Coelophysis is the state fossil of New Mexico, and one of the earliest dinosaurs known from North America. The NMMNH has a great collection of Triassic reptile fossils, displaying numerous skulls of various creatures that have been found in the state. One of the best displays is a gorgeous mount of a Redondasaurus attacking a Placerias. Both creatures have been found in New Mexico, the Redondasaurus has a very impressive skull filled with teeth capable of crushing bones. In addition to Redondasaurus, there are several other phytosaur skulls from New Mexico on display, including several large skulls of Pseudopalatus. While there aren’t a lot of complete fossil mounts at NMMNH, there are a lot of fossils on display. Favorites include a beautiful skull of a juvenile Pentaceratops, an impressive crest of a Parasaurolophus, and the jaw of a Tyrannosaurus, all found in New Mexico. 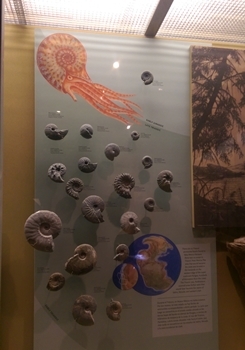 The museum has a nice display of fossils from the Cretaceous sea, including an attractive display of ammonites. One of the smallest fossils on display in the museum is also one of the most interesting: Adelobasileus, a tiny creature from the late Triassic period that has the important distinction of being the oldest fossil mammal yet discovered. It is thought that it is a common ancestor or close to the common ancestor of all modern mammals, including us! 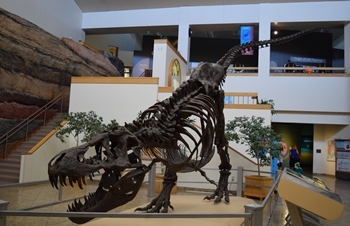 While fossils are the largest part of the museum, there are also several other attractions available, including a 3D “Dynatheater” that shows various IMAX movies as well as a large planetarium; both have showtimes throughout the day. If you want to get out and explore, the historical area known as “Old Town Albuquerque” is about a block away. The oldest church in the city, San Felipe de Neri, is located in the heart of this district. It was founded in 1706, and the current building in old town was built in 1793. There are plenty of shopping opportunities around the plaza, and at least a dozen restaurants. We were disappointed that one of the dinosaurs we hoped to see had been taken off display during our visit–the tyrannosaur from New Mexico Bistahieversor. Although the first fossils of this dinosaur were found in the 1990’s, it wasn’t until 2010 that a study identified them as a new species of tyrannosaur. Nicknamed the “Bisti Beast,” it is one of the few tyrannosaurs discovered in the southern half of what was then the island continent Laramidia. Otherwise, we were delighted with our visit to NMMNH and hope to get back for another visit someday. Hopefully, Bistahieversor will be back when we do! My six-year-old son accompanied me on our visit, and he enjoyed himself very much. In fact, I remember thinking that during our trip to the museum he spent more hours than usual looking at exhibits and was still fired up and having fun. He usually tires out a little after a couple hours looking at displays, but in Albuquerque we spent at least four at the museum, and he was still going strong. While he loved the giant Seismosaurus/Saurophaganax display, his favorite display was a traveling exhibit featuring the amazing whorl-toothed, shark-like fish Helicoprion that lived during the Permian and Triassic periods.